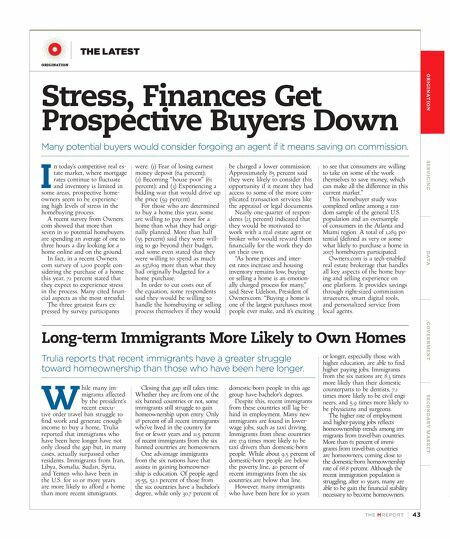 TH E M R EP O RT | 43 O R I G I NAT I O N S E R V I C I N G DATA G O V E R N M E N T S E C O N DA R Y M A R K E T ORIGINATION THE LATEST Long-term Immigrants More Likely to Own Homes Trulia reports that recent immigrants have a greater struggle toward homeownership than those who have been here longer. W hile many im- migrants affected by the president's recent execu- tive order travel ban struggle to find work and generate enough income to buy a home, Trulia reported that immigrants who have been here longer have not only closed the gap but, in many cases, actually surpassed other residents. Immigrants from Iran, Libya, Somalia, Sudan, Syria, and Yemen who have been in the U.S. for 10 or more years are more likely to afford a home than more recent immigrants. Closing that gap still takes time. Whether they are from one of the six banned countries or not, some immigrants still struggle to gain homeownership upon entry. Only 18 percent of all recent immigrants who've lived in the country for five or fewer years and 11.5 percent of recent immigrants from the six banned countries are homeowners. One advantage immigrants from the six nations have that assists in gaining homeowner - ship is education. Of people aged 25-55, 52.1 percent of those from the six countries have a bachelor's degree, while only 30.7 percent of domestic-born people in this age group have bachelor's degrees. Despite this, recent immigrants from these countries still lag be - hind in employment. Many new immigrants are found in lower- wage jobs, such as taxi driving. Immigrants from these countries are 17.9 times more likely to be taxi drivers than domestic-born people. While about 9.5 percent of domestic-born people are below the poverty line, 40 percent of recent immigrants from the six countries are below that line. However, many immigrants who have been here for 10 years or longer, especially those with higher education, are able to find higher paying jobs. Immigrants from the six nations are 8.3 times more likely than their domestic counterparts to be dentists, 7.2 times more likely to be civil engi - neers, and 5.9 times more likely to be physicians and surgeons. The higher rate of employment and higher-paying jobs reflects homeownership trends among im - migrants from travel-ban countries. More than 61 percent of immi- grants from travel-ban countries are homeowners, coming close to the domestic-born homeownership rate of 68.8 percent. Although the recent immigration population is struggling, after 10 years, many are able to be gain the financial stability necessary to become homeowners. Stress, Finances Get Prospective Buyers Down Many potential buyers would consider forgoing an agent if it means saving on commission. I n today's competitive real es- tate market, where mortgage rates continue to fluctuate and inventory is limited in some areas, prospective home - owners seem to be experienc- ing high levels of stress in the homebuying process. A recent survey from Owners. com showed that more than seven in 10 potential homebuyers are spending an average of one to three hours a day looking for a home online and on the ground. In fact, in a recent Owners. com survey of 1,200 people con - sidering the purchase of a home this year, 72 percent stated that they expect to experience stress in the process. Many cited finan - cial aspects as the most stressful. 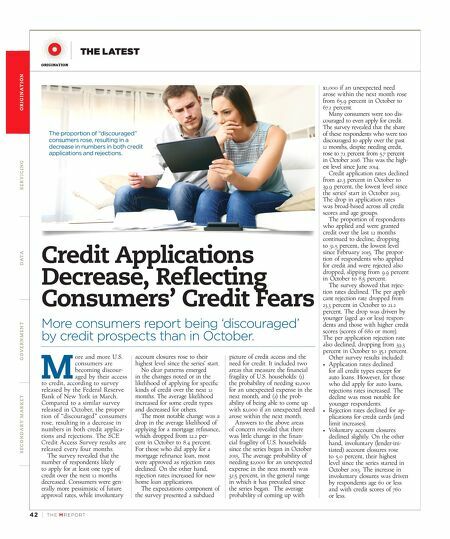 The three greatest fears ex- pressed by survey participants were: (1) Fear of losing earnest money deposit (64 percent); (2) Becoming "house poor" (61 percent); and (3) Experiencing a bidding war that would drive up the price (59 percent). For those who are determined to buy a home this year, some are willing to pay more for a home than what they had origi - nally planned. More than half (55 percent) said they were will- ing to go beyond their budget, and some even stated that they were willing to spend as much as $37,809 more than what they had originally budgeted for a home purchase. In order to cut costs out of the equation, some respondents said they would be willing to handle the homebuying or selling process themselves if they would be charged a lower commission. Approximately 85 percent said they were likely to consider this opportunity if it meant they had access to some of the more com - plicated transaction services like the appraisal or legal documents. Nearly one-quarter of respon- dents (23 percent) indicated that they would be motivated to work with a real estate agent or broker who would reward them financially for the work they do on their own. "As home prices and inter - est rates increase and housing inventory remains low, buying or selling a home is an emotion- ally charged process for many," said Steve Udelson, President of Owners.com. "Buying a home is one of the largest purchases most people ever make, and it's exciting to see that consumers are willing to take on some of the work themselves to save money, which can make all the difference in this current market." This homebuyer study was completed online among a ran - dom sample of the general U.S. population and an oversample of consumers in the Atlanta and Miami region. A total of 1,289 po - tential (defined as very or some- what likely to purchase a home in 2017) homebuyers participated. Owners.com is a tech-enabled real estate brokerage that handles all key aspects of the home buy - ing and selling experience on one platform. It provides savings through right-sized commission structures, smart digital tools, and personalized service from local agents.